Does this test really determine your risk of Alzheimer's? 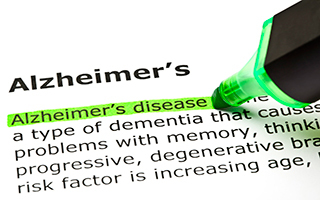 Recently, a blood test that purportedly identifies which healthy seniors will get Alzheimer's disease made the news. But now there are questions about its accuracy. Researchers from Georgetown University studied cognitively normal older adults and found that levels of 10 substances in the blood were different in those who developed mild amnestic impairment or Alzheimer's disease within three years compared to those whose cognition did not decline. The 10-marker panel had sensitivity and specificity of 90% to distinguish the two groups. This means the test yields 10% false-negative and 10% false-positive results. That sounds promising. But what they didn't mention was a different measurement, the positive predictive value (PPV), which shows the accuracy of the positive results. According to the report, about 5% of the group became cognitively impaired over the three-year period. So let's say we have a sample population of 1,000. Using a rate of 5%, 50 will actually become cognitively impaired. But using the 90% specificity and sensitivity rates, 10% of the 50 (5 people) will test falsely negative. Of the 950 who don't become impaired, 10% (95 people) will test falsely positive. This results in a total of 140 positive results, only 45 of which are correct. The PPV is the fraction of total correct positives to total results, or 45/140 (32%). That's not a great result, particularly because there's no way to confirm a positive result to find out if you're receiving a false positive. The only real advantage is that it can put you on alert to watch out for symptoms, which you're likely doing anyway. While other tests have low PPVs too, they typically have good follow up options to help identify false positives. For example, the PPV for Pap smears is about 6%, but you can have a colposcopy to confirm results. There isn't a similar option for this test. All you can do is take it into consideration along with your other risk factors, such as age, gender, education level, and personal and family history. It looks like this test is no more of a "gold standard" than any others. But it may be part of the picture. If so, it brings up another question: why even do the test if there's nothing you can do to confirm the results? Fortunately, there's actually a lot you can do to prevent Alzheimer's and other forms of dementia. I discussed some of them in the April issue of my newsletter. Meanwhile, it makes sense to feed your brain with nutrients, whether you're identified as high-risk for Alzheimer's or not. A number of them can be found in Advanced Memory Formula.